I started my pH balance diet scoring system with Potential Renal Acid Load (PRAL). This is a relatively simple way to estimate how healthy your diet is. Let me explain why PRAL, and simpler alternatives, are important to planning a healthy pH balance diet. Along the way, I will also warn you of the dangers of older methods. We have known about weaknesses of these older methods for over 30 years. Yet, they are still used to promote expensive drinks, supplements, books and diet plans. Like all estimating systems, PRAL is only a guide to how your body is likely to react to your food and drink. The exact effects are found by testing urine for its pH value. In case of illness, your doctor requires full blood and urine analysis to get a clear picture of your health. For diet planning, we need a simple way to score our pH balance diet plan. If the scoring system is wrong, we might end up with insufficient nutrients or avoiding foods that are actually OK. To see what makes a good scoring system, we really need to understand what pH balance really means. In 1907, Sherman and Sinclair published “The balance of acid-forming and base-forming elements in food.” This led to a new way of looking at nutrition. We learned our kidneys produce acid or alkaline urine in response to different foods. Chemical analysis of food became a tool for diet planning. Food tables are extremely important to nutritionists and other scientists. They dictate dietary advice and hospital menus. Underlying all these tables is a need to assess and plan food intake to estimate the acid load on kidneys. Various digestive and metabolic processes use food to build and maintain our bodies. Different diets contain different nutrients, but our bodies always seek to balance vital properties such as temperature, fluid level, and pH. Our kidneys play a huge role in maintaining balance by excreting excess nutrients. Thus, urine will be acid or alkaline depending on diet. Scientists call this NEAP (Net Endogenous Acid Production). Its exact measure involves 24-hour urine test. That might be acceptable in the hospital or laboratory. For the kitchen or grocery store, we need a simpler measure. Simpler measures are collectively known as “estimated NEAP.” There are several methods, neatly summarized by Frassetto in “Standardizing Terminology for Estimating the Diet-Dependent Net Acid Load to the Metabolic System.” I selected PRAL when I first started looking at pH balance. From my research at the time, it seemed the simplest way to estimate NEAP. I now believe there are easier ways. But first, let me explain some dangers of using outdated NEAP estimates. The Internet has brought nutrition information to the masses. pH Balance is a popular term, with thousands of books, and millions of pages, extolling the virtues of alkaline diets. These are often accompanied by pH tables and charts showing the relative health of foods according to pH value. Unfortunately, this is mostly out-dated. The article discusses the history of the acid/alkaline ash concept, assumptions underlying it, mechanisms by which urine is acidified, how the acid/alkaline ash content of diets is calculated from food tables, difficulties arising in acid/ash calculations, and their validity in predicting urine pH. The authors conclude that while diet does influence the pH of urine, present calculation methods are time-consuming, imprecise, and do not permit quantitative prediction of urine pH. Better methods for calculating the effects of diet on acid-base balance are needed. Better methods have been developed, but this does not stop many books and websites using out-dated methods. The doubts expressed by Dwyer in 1985 have not stopped people presenting attractive food comparison charts. These are often used to promote so-called health drinks and supplements. 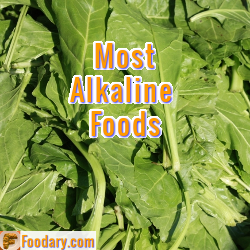 Be careful how you approach acid alkaline food charts. If they do not explain the calculation method used for estimating NEAP, then it is probably bad data. I will cover both these methods in detail in separate articles, but here is a quick overview. NEAP can be predicted with confidence from the readily available contents of only 2 nutrients in foods. Provisionally, these findings allow estimation and regulation of NEAP through diet modification. Both LAKE and Pro/K methods for scoring pH balance diets are only valid for whole foods. Of course, a healthy diet should be based on whole foods, so this should not be a problem. However, we often need to assess how unhealthy a bad diet is. Processed foods require more complex scoring calculations. They need to account for unnatural nutrient profiles that confound the simplicity of scoring methods I describe here. Though the Pro/K is a simple calculation mathematically, it is not easy to derive milliequivalent data from regular nutrient databases or food labels. I will investigate how easy it is to derive simple tables for Pro/K scoring. In conclusion, it seems that LAKE is a compelling alternative to PRAL. Such a simple scoring system makes it easy to measure shopping and eating. Importantly, it is easy to improve your alkaline diet by swapping plus scores for minus scores. What do you think about Redefining pH Balance Diet Scores? Please share your thoughts in the Food Forum.